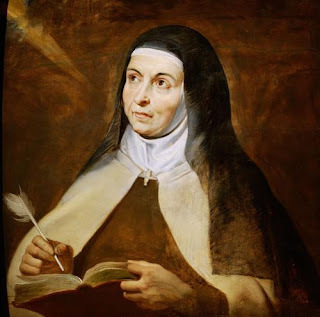 Today is the solemnity of St. Teresa of Jesus, more commonly know as St. Teresa of Avila. The homily was about St. Teresa, as a Doctor of the Church, a Mystique, a Contemplative but Active woman. But the teaching from St. Teresa that retains in me is "God alone is enough." Our Homilist told us that in his opinion, male leader is prone to corruption and other similar deeds. Unlike for females who are mostly the woman of the house, more prayerful, more into doing God's teachings, similar to St. Teresa. He mentioned that our country is in turmoil and it is time to choose a female leaders, who are more prayerful, who live by example, and who follow God's teachings. While he was saying these, I was thinking about Grace Poe if she was prayerful, who lives by example, etc. It seems like Fr. Dave was endorsing Grace. Were they friends? Did they spoke to one another? I do not know if she was prayerful nor do I follow her actions. But what I do know is that one reason she is running for President is to get back from the loss of her father in the presidential election. And that is not following God. But later this afternoon, I have learned that Miriam Santiago is running for President. I was stunned. Did Fr. Dave knew Miriam will be running? Is he endorsing Miriam? Again, I do not know her spiritual practices. But it could be a sign. She is my bet as well as her running mate. We just pray that may our leaders put God first before anything else. **Maybe that is why I am happy as I am right now.